Artikel noch nicht erschienen, voraussichtlicher Liefertermin ist der 29.6.2019. Der Artikel Scott Armstrong: Quantitative Stochastic Homogenization and Large-Scale Regularity wurde in den Warenkorb gelegt. Ihr Warenkorb enthält nun 1 Artikel im Wert von EUR 120,46. The focus of this book is the large-scale statistical behavior of solutions of divergence-form elliptic equations with random coefficients, which is closely related to the long-time asymptotics of reversible diffusions in random media and other basic models of statistical physics. Of particular interest is the quantification of the rate at which solutions converge to those of the limiting, homogenized equation in the regime of large scale separation, and the description of their fluctuations around this limit. 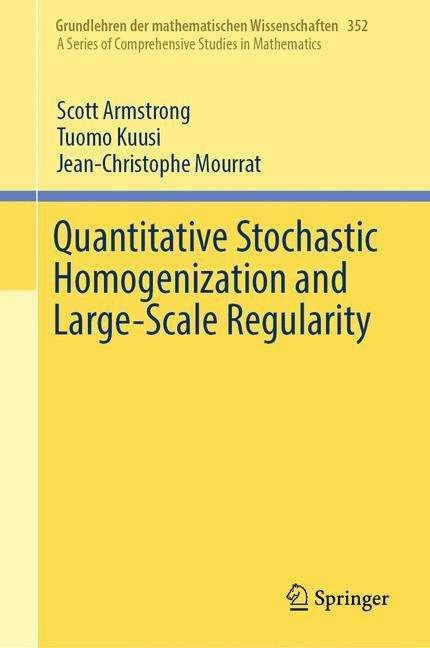 This self-contained presentation gives a complete account of the essential ideas and fundamental results of this new theory of quantitative stochastic homogenization, including the latest research on the topic, and is supplemented with many new results. The book serves as an introduction to the subject for advanced graduate students and researchers working in partial differential equations, statistical physics, probability and related fields, as well as a comprehensive reference for experts in homogenization. Being the first text concerned primarily with stochastic (as opposed to periodic) homogenization and which focuses on quantitative results, its perspective and approach are entirely different from other books in the literature.